Roughly chop apples or otherwise remove the core. Add everything to a high powered blender and blend about 1-2 minutes It’ll turn brown – don’t freak out, that’s normal. If using a Vitamix, feel free to let it blend for 5-10 minutes or until hot. Strain cider through a nut milk bag or fine mesh strainer lined with cheesecloth. Serve hot or cold. Store in a sealed container in the fridge for up to two weeks. 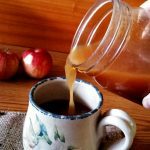 If it tastes too watered down, feel free to add an additional apple or two and blend again. Modify to your liking! I’m sure different varieties of apple might require more or less apples to get the best flavor.